Here in car-obsessed Southern California, the city of San Diego has actually done a good job of providing mass transit services, in the downtown area at least, through the light rail system called The Trolley. 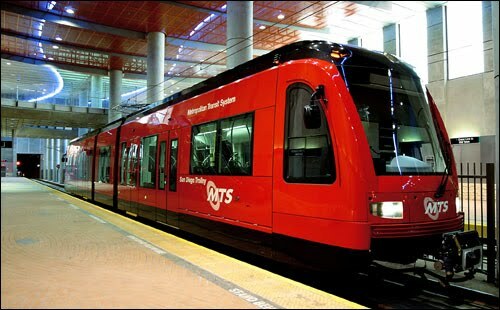 You can't miss the bright red trains reminding San Diegans that there are other ways to get around besides driving. Well, now the North County is going to get more public transit options. The Metropolitan Transit System will nominate the Mid-Coast Corridor Trolley Extension for federal New Start funding. This is great news for UCSD students and residents of the University City/La Jolla area as the line will head north from the Old Town Transit Center all the way to the University Towne Center and UCSD campus. It will share the same tracks as the Coaster commuter train for part of the route, but unlike the Coaster it will provide more frequent service and once it gets off the Coaster track, it makes more convenient local stops. But the Transport Politic website is critical of the plans because they don't cover vibrant inner city neighborhoods such as University Heights, Hillcrest and North Park. But I think this is absolutely the right plan to apply for funding. The potential for 30,000 UCSD students to have a direct connection to downtown is worth it, just as the Metro Westside Extension in Los Angeles will provide the thousands of UCLA students and faculty with a direct connection to downtown. "The Mid-Coast Corridor Transit Project will improve regional transportation capacity and mobility by providing reliable transit service along one of the most congested corridors in San Diego County. This project will help minimize dependence on auto travel and will complement - and integrate with - existing transit systems in San Diego." This new Trolley route to University City will do much to unify the region and will help the continued revitalization of downtown San Diego.